You are here: Home » Children and Nature » National Day of Service: Where will you be? Want to keep that fresh-start feeling that comes as you launch into a new year … the excitement of embarking on new adventures, striving to attain new goals, living out carefully deliberated intentions, or jumpstarting the year with ideas that sprang up as quickly as the new year? For many, the novelty fades within the first few weeks of the new year as motivation melts and inspiration evaporates. They succumb to the challenges that often come with trying to forge new routines and habits. But, we’ve got just the thing to breathe a little life into your fresh-start campaign … giving back! Doing something good for others has a way of invigorating the body, inspiring the mind, and warming the soul. Head down towards Founder’s Park around 10 a.m. and meet up with other Old Town residents who are making their way from their homes to the waterfront, stopping to clean up as they go. Volunteer’s, including my second daughter’s Brownie troop, will be collecting food at Douglas MacArthur Elementary School for their annual National Day of Service Food Drive. Food will be collected at the curb, organized on the school’s front lawn, and later delivered to an Alexandria food bank. Simply drive up and drop off a bag of food (non-perishable in non-breakable containers). It’s a really fast and easy way to give back. Events are being held at many local parks and recreational areas including: Huntley Meadows,Anacostia Park and at sites in DC where you can help prepare for the MLK Parade/Peace Walk. There are also events being held at the Charles Barrett Recreation Center, the Carpenter’s Shelter and the Nannie J. Lee Recreation Center. And, if you’ve still go time and energy left over after volunteering, head to the National Day of Service Fair on the National Mall where you can scope out organizations, opportunities, and causes to which you can contribute on an ongoing basis. As for me, I’ll be working on Saturday, leading a neighborhood and stream cleanup at Barcroft Park and along Four Mile Run Dr. from 10 a.m. to 12 noon. Join me if you can! 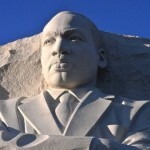 In the meantime, learn more about Dr. Martin Luther King, Jr. and how you, too, can have an impact.